The objective of this project is to create a lighting infrastructure service platform, which will then provide opportunities for intelligently controlled lighting, as well as new innovations and user-focused services for urban spaces. The project will pilot smart lighting solutions in six Finnish cities in different kinds of urban environments. In the pilots, the objective is to use lighting infrastructure as a service platform – an Internet of Things backbone – in an intelligent city. 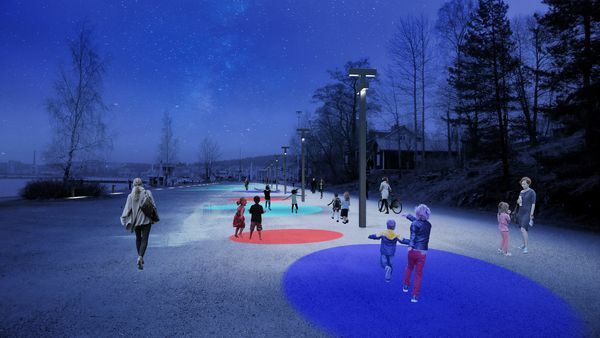 The pilot site in Lahti is the historically significant Satamaraitti harbour trail Lighting in the area is being overhauled and the infrastructure supplemented with solutions such as optical fibre and sensor installations. The area is also being provided with an open WiFi network. Alongside the intelligently controlled basic lighting, another form of lighting will be provided to increase the experiential quality and enjoyability of the area after dark. With its use of colour and dynamic nature, the light can be used as a means through which to communicate with and activate visitors, encouraging them to move around with game-like apps. Local residents have been active in their participation of the development of the area at a range of events. National trial installations of SenCity will create a pilot environment for Finland, where new solutions based on city data can be developed and tested in the future, too.